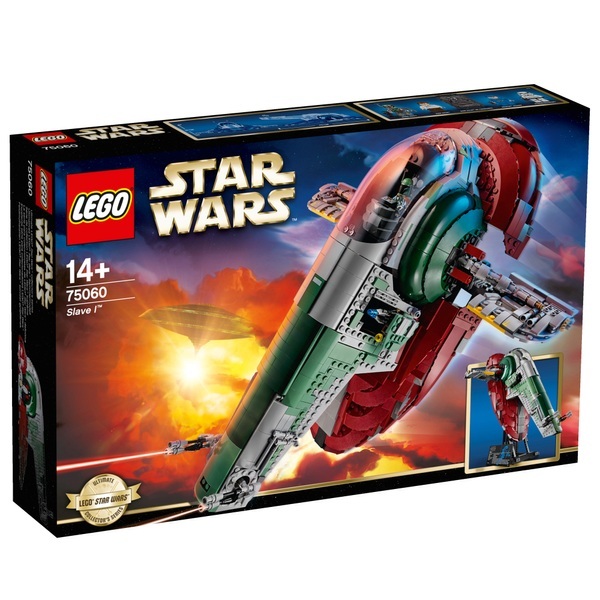 Hunt down the galaxy’s fugitives with the LEGO 75060 Star Wars Slave I! This iconic starship has seen many bounty-hunting adventures. Build your own Slave I to imagine even more. Lift off with Boba Fett, the legendary bounty-hunter, to seek your fortune. Relive the capture of Han Solo in Star Wars: Episode V The Empire Strikes Back and take off from Bespin with the carbonite- imprisoned Rebel hero trapped in the cargo hold of the powerful Slave I.
Rotate the minifigure cockpit and wings to transform the LEGO 75060 Star Wars Slave I model from its iconic upright flight mode to landing mode. This exclusive and highly detailed model is packed with Jango Fett’s chosen weapons. Open the side hatches to unleash missiles from the hidden guns and repel attackers with the 2 rotating dual shooters. Attach the stand to display this iconic ship in its characteristic upright flight. The LEGO 75060 Star Wars Slave I comes with 4 detailed LEGO minifigures with weapons: Boba Fett, Bespin Guard, Sormtrooper and Han Solo, plus Han Solo trapped in carbonite. Minifigure weapons include a special blaster pistol for Boba Fett™, a blaster pistol for Bespin Guard™ and a blaster rifle for the Stormtrooper™.